Italians take wine very seriously. And just as they eat regionally, Italians drink regionally. Go to Tuscany, and you will find locals drinking Chianti, Vernaccia di San Gimignano, Brunello di Montalcino, and other Tuscan wines with their meals. Head to Abruzzo, and you will find Montepulciano d'Abruzzo, Cerasuolo d'Abruzzo, or Trebbiano d'Abruzzo on the table. Italy is the largest producer of wine in the world, and it exports much of its wine to North America. Every Italian region produces good wine (some more than others, of course). Italian wines run the gamut from fresh, lively wines (either red, white, or rosé) best sipped young to deep, noble wines meant to mature in a cool cellar. At our NYC cooking loft, we offer wine tastings every few months, and each wine is introduced by Costas Mouzouras, our Wine Director. Every Italian wine belongs to one of four legal categories: DOC (Denominazione di Origine Controllata, or Denomination of Controlled Origin), DOCG (Denominazione di Origine Controllata e Garantita, or Denomination of Controlled and Guaranteed Origin), VdT (Vino da Tavola, or Table Wine), or IGT (Identificazione Geografica Tipica, or Typical Geographic Identification). DOC and DOCG regulations specify the grapes to be used for a specific wine, the yield of grapes per hectare, the production zone, the manner in which the wine is to be vinified, and the aging period. While by and large the country's best wines have historically been labelled DOC or DOCG, nowadays a number of Italy's most sought-after wines do not comply with strict DOC or DOCG laws (which stipulate almost exclusive use of local grape varietals) and are categorized as VdT or IDG wines; this is the case, for example, for Tuscany's renowned super-Tuscans, a class of expensive wines vinified from a blend of indigenous and imported grape varietals. 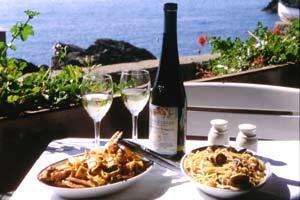 One way to approach Italian wine is to pair regional wines with regional recipes. In other words, if you're cooking a meal from Molise, stick with wines from Molise; if something Sicilian is on the menu, look to Sicilian wines instead. This is certainly a valid, and traditional, starting point, but it can also be limiting: sometimes the best food and wine pairings require that you step outside regional boundaries, especially for those regions where a narrower range of wines is vinified. Apéritifs and cocktails: Sparkling wines work well; I like Spumante Brut or Prosecco. Fish, seafood, pasta in cream sauce: Whites tend to be better here; try Bianco di Custoza, Chardonnay, Falerio, Fiano di Avellino, Frascati, Friulano, Galestro, Gavi, Greco di Tufo, Orvieto, Pinot Bianco, Pinot Grigio, Soave, Verdicchio, or Vernaccia di San Gimignano. Poultry, veal, pasta in tomato or meat sauce: Light-bodied or medium-bodied reds are ideal; pour Barbera, Bardolino, Chianti, Dolcetto, Grignolino, Lambrusco, Merlot, Montepulciano d'Abruzzo, Nebbiolo, Rosso di Montalcino, or Valpolicella. Game, fowl, roasts, red meat, and aged cheeses: Full-bodied reds are most suitable; serve Amarone, Barbaresco, Barolo, Brunello di Montalcino, Cabernet Sauvignon, Carmignano, Chianti Classico Riserva, Gattinara, Refosco, Rosso Piceno, Salice Salentino Classico, Taurasi, or Vino Nobile di Montepulciano. Sweets: Sparkling or sweet wines, sometimes fortified, pair nicely; try Asti Spumante, Malvasia, Marsala Superiore or Vergine, Moscato d'Asti, Picolit, or Vin Santo. There are few things better in life than a great wine. Perhaps a great wine paired with great food... enjoyed in great company! That's why I decided to offer wine tasting classes. Geared to wine aficionados, these classes are the best way to learn more about Italy's top wines and enjoy a fabulous meal. The classes combine a hands-on cooking lesson (45 minutes of cooking) featuring extraordinary ingredients (think wild mushrooms, duck, aged Parmigiano Reggiano, and the like) with an informative, entertaining wine tasting that will give you the unique opportunity to taste some of Italy's top wines: from Super Tuscans to Piedmont's big, bold reds, you will experience memorable Italian wines and learn more about what makes them special. Each wine will be introduced by a master sommelier, its flavor profile and best pairings discussed. Wine tastings last from 6 PM to 9 PM on weeknights, and are led by Costas Mouzouras, RUSTICO's charismatic Wine Director (from NYC's Gotham Wines). Tastings always sell out fast, so be sure to reserve early! If you'd like to host a wine tasting for your next corporate event or private party, call 917-602-1519 to inquire about rates, menus, and availability. Knowing what the words on an Italian wine label mean will help you make smarter purchases at the wine store. Select a young, creamy Gorgonzola for the stuffing; it is usually labeled Dolcelatte in Italian markets and cheese shops. Make the pears: Combine the Chianti, 2 cups of water, the sugar, cinnamon, and orange zest in a 3-quart pot. Bring to a gentle boil over medium heat, stirring until the sugar dissolves, and drop in the pear halves, cut side down. Cook until the pear halves are tender when pierced with a knife, turning once to cook evenly, about 15 to 25 minutes total (watch that they do not overcook, or they will fall apart). Meanwhile, make the Gorgonzola mousse: In a food processor, combine the Gorgonzola, 1/2 cup of the walnut halves, and the cream until smooth; add more cream if needed to thin it out. The mousse should be as thick as jam. Refrigerate 30 minutes (or up to 2 days) to firm it up; this makes piping easier. 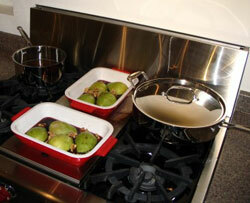 Using a slotted spoon, remove the pear halves from the poaching liquid; place on 8 plates, cut side up. Reduce the poaching liquid until it becomes almost syrupy in consistency, about 15 minutes over medium heat, watching that it does not caramelize or burn. Discard the cinnamon and orange zest. The red is deep, robust; the white is light. Hearty, tannic, harmonious, robust; dry with a berry fragrance. 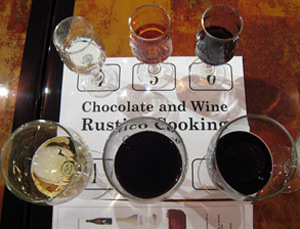 Medium-sweet or sparkling versions are good dessert wines. Vinified dry, medium-sweet, sweet, and raisined; lightly aromatic, warm, harmonious. Garnet red, with violet tints; fine aroma, fresh, fruity. Also vinified in a fortified dessert version. Delicately sweet wine from the isle of Elba. Delicate bouquet, full-bodied, moderately sweet and velvety; exists in a raisined version. Dessert wine with a haunting aroma. The red is airy and full when aged, with a slight bitter aftertaste; the rose is dry, persistent, and velvety. This denomination includes 19 wines, vinified still, fizzy, sparkling, raisined, and fortified. An extraordinary port-like wine, deeply perfumed with rich berry and spice, medium-sweet. The red is medium-bodied; the white is subtle, with good acidity; the rose is best enjoyed young. Vinified dry or medium-sweet; delicate aroma, fresh, harmonious taste. Harmonious, dry, gently bitter wine with delicate almond undertones. Fresh, distinctive, with a fruity aroma; also vinified sparkling. The red is intense and fruity; the white is fresh, dry, and lightly bitter; the rose is delicate, dry, and harmonious. One of Italy's most famous sparkling wines, produced by the Charmat method of fermentation; with persistent mousse and fine bubbles, it is intense, aromatic, delicately sweet, with a crisp acidity and ripe flavor of the Moscato grape from which it is made. The red is velvety and delicately sweet; the rose has a slightly winy perfume and pleasant bouquet, and is vinified both dry and ever-so-slightly sweet; the white is dry or slightly sweet and velvety. Vinified both still and sparkling. Intensely fragrant, robust, harmonious, dry, intense, austere yet velvety; aged a minimum of 26 months. Dry, medium-bodied becoming full-bodied after aging; the one from Asti is best, slightly fruity and mellow. Elegant, medium-bodied, silky, highly fruity, with a berry aroma; one of Italy's best novello wines. Dry, full-bodied, silky, robust; aged a minimum of 3 years, but best after 5 to 8. Aerate 2 hours before serving. Straw-yellow in color, with a dry, fresh, harmonious taste and delicate aroma. Dry, slightly aromatic; also vinified medium-sweet. Pale straw-yellow with green tints; neutral nose, grapey scent, dry and fruity taste. Perfumed, lightly aromatic fragrance; well-balanced with good body; best sipped within 1 year of bottling. Zesty, delicate, dry wine with a slightly bitter finish, medium-bodied and soft; also vinified in a sparkling version. Best within 1 year of vintage. The region's most interesting indigenous white; pleasantly aromatic, fresh, and harmonious; vinified still and sparkling. Dry, harmonious, ethereal, and velvety ruby-red wine that ages well. There is also a delicately aromatic white version and a rose version that is best drunk within 1 year. The red is produced in a novello and riserva version; the rose is delicately fruity; the white is dry, fruity, and harmonious. Dry, acidic, lightly fizzy, with undercurrents of mountain herbs. Delightful nuance of fresh herbs; best enjoyed in its first year of life. Pleasant, fruity wine with a scent of grapes; meant to be drunk young. The red is intense, moderately tannic; the white is light. Vinified both still and sparkling. Its vinous aroma becomes airy as the wine ages; warm, full-bodied taste. Wine with a soft, mellow, delicately musty truffle scent and color of strawberries; exists in a sparkling version as well. Wine with scent of wild flowers and a tendency to become velvety with age. The red is harmonious and velvety; the rose is coral-pink with a fruity aroma and dry taste. Intense ruby-red, dry, tannic, robust, with a persistent bouquet and dried fruit, tobacco, and plum notes; aged 2 years in casks. Distinct, intense aroma, full-bodied taste with a firm aftertaste. Slightly tart, rather tannic, with a color that shows violet tints. Soft taste hinting at almonds and a delicate aroma. Unique flavors and aromas characterize these wines; vinified still or sparkling, sometimes from raisined grapes. Dry, full-bodied, distinctive; intense bouquet and dry taste. The red is robust, bold, dry, with a substantial body and muscular structure; the rose is dry. Also vinified fortified and sweet. The red is medium-bodied and fruity; the white can be aged up to 5 years. High-acidity wine, pleasant and dry, with a bouquet reminiscent of roses. Six wines are sold under this label; also vinified in novello and raisined versions. Full-bodied nose, low acidity, firm tannins, violet tones that become more intense with age; dry, soft, velvety. Ruby wine with a dry flavor and harmonious finish. A number of wines are produced under this label; the red, aged more than 2 years, is fairly robust and dry, the white is dry and refreshing, and the rose is delicate and lightly fragrant. The red is ruby-hued, intense, dry, tannic and acidic when young, velvety when aged; the white is refreshing, crisp, fruity, lightly bitter; the rose is subtle, dry, and velvety. Vinified in a sparkling version as well. Ruby color and intense perfume; best sipped within 2 years. Vinified in dry, semi-dry, sparkling, and novello versions, Castelli Romani are the most famous wines of the region and comprise the following appellations: Colli Albani; Colli Lanuvini; Frascati; Marino; Montecompatri Colonna; and Velletri. Intense, with a slight bitter aftertaste. Dry and vivacious with a slightly bitter aftertaste. The region's second most important red; fruity, intense, dry, with a deep cherry color. Cherry-red color, intense, delicate bouquet, and full, round, harmonious flavor. Delicate bouquet and soft, bitterish taste; ranges from dry to sweet and is vinified still and sparkling. The most famous of the region's wines, with a straw yellow color and intense aroma characteristic of muscat; also vinified in a sweet raisined version. Dry, with tannins that become mellow over time; aroma reminiscent of violets. Dry, tannic, mellowing with age; aroma reminiscent of violets. Vinified in the heartland of the Chianti zone. Wine with an intense bouquet, slight almond aftertaste, and hints of flowers. The red is dry and full-bodied; the white is straw-yellow in color, fresh, and delicate; the rose is harmonious and fresh. Crisp wine, refreshing, with a bracing acidity. The red is warm, harmonious, velvety with age; the white is vivacious, dry, delicate; the rose is refreshing. The red has a round taste; the white is well-balanced; the rose is slightly fruity and offers a zesty bouquet. Full-flavored, perfumed, soft, and harmonious. Dry, balanced, with a characteristic bouquet. The red is dry and slightly tannic; the white is fruity and dry with a bitterish aftertaste, and is vinified both still and fizzy. The red is dry, with a slightly bitter finish and persistent bouquet; the rose is light. The red is persistent, with a lingering bouquet and dry, fresh, velvety flavor; the white is delicate, dry to medium-dry, and medium-bodied. The red and rose are light and medium-bodied; the white is light, crisp, bracingly acidic. An everyday wine best drunk young; refreshing and straight-forward. The vines for this glorious wine are protected from the harsh north wind and yield what many have called a "perfect wine, with a fine perfume and medium body. The red is dry and harmonious; the white is dry, harmonious, at times fruity; the rose can be fragrant. Five red and one rose wine produced under various names, including Nero d'Avola, Pignatello, Pachino, and Frappato, depending on the grapes used. he French enfer means "hell, but this heavenly wine is pleasantly bitter and has a characteristic bouquet. Dry, full, and rich; also vinified in a rare raisined version. The red has a fruity bouquet and dry, harmonious flavor; the white is fruity and fresh. Also vinified in novello and sparkling versions. Delicately aromatic white with a dry, persistent, balanced flavor; made in the province of Viterbo since at least 1200. Vinified at the foot of the still-active Etna volcano since at least the sixteenth century. The red and rose are warm, perfumed, dry, and robust; the white is dry, fresh, with golden tones. Delicately acidic, dry; also vinified in a sparkling version. Lightly scented, dry, somewhat bitter. The famous Falernum of ancient Rome; the red has an intense perfume and a dry, robust, harmonious flavor; the white is dry, zesty, with light green tones. Ruby-red, medium-bodied wine with a delicate, airy, and persistent bouquet and ethereal, dry, harmonious flavor. White with a notable citrus aroma that can stand aging. One of the few white wines suitable for prolonged aging; it has a pear finish. Dry or off-dry spumante (sparkling wine) with abundant fine perlage. Dry, slightly fruity, and aromatic; ages well. Wine with a strong blackberry scent; vinified dry, sweet, and sparkling. The Tocai of old, a white not related to the Tokay of Alsace or the Tokaji of Hungary; light in both color and body, slightly bitter, with a floral aroma and a hint of almonds, it is intended to be drunk young. Wines produced from various grapes; vinified still and sparkling. Numerous wines, both still and sparkling, from a variety of indigenous grapes. Over a dozen wines obtained from different grapes; still or sparkling. Different wines vinified still or sparkling from local grapes. Vinified in 5 versions, including a novello. Light and fresh, with a fruity scent and notable aftertaste. The rich volcanic soil of the Roccamonfina volcano yields intense, sunny wines. Harmonious, dry, with an accentuated perfume and delicate bitterness. Medium-bodied, straw-yellow in color, with a characteristic perfume, dry flavor, and slight bitterness. Perfume evocative of violets; dry, harmonious, with a pleasantly bitter finish, it ages well. Dry, delicate, fruity, aromatic, and balanced; vinified still, fizzy, or sparkling. Numerous wines, including Primitivo and Aleatico, are produced in this area in dry, sweet, and fortified versions. Sweet, and sometimes dry, fortified wine from the province of Cagliari. White with a pleasant bouquet and delicate flavor; vinified still and sparkling. This amber-hued, luscious, coppery dessert wine is vinified from what may be Italy's oldest varietal, the Greco grape, in the town of Bianco; it is soft, ethereal, with a balanced flavor and airy bouquet. Has an almond and peach aftertaste; also vinified in a sparkling version. Pronounced acidity and good structure; best savored young. Wine with a woody nose and good viscosity. The red is velvety, dry, best after 1 to 4 years; the white is dry and straw-yellow in color; the rose is subtly fruity in some bottlings. Characterful wine with good potential for wood aging. Delicate nose, medium body, good acidity. Scent of red fruit and underwood and a full-bodied flavor; also vinified from raisined grapes. Vinified at the foot of Mount Vesuvius; the red is dry, harmonious, ruby-red; the white is lightly acidic; the rose is off-dry, less intense than the red. Also vinified in fortified and sparkling versions. Somewhat tannic, soft, velvety red with real character; fragrant yet robust rose. elegant and fresh. Sparkling wine which became wildly popular in the US in the 1980s in its slightly sweet incarnation, Lambrusco Reggiano. Good Lambrusco is dry or off-dry, with a pronounced acidity. The red has a pleasant, at times fruity bouquet and dry flavor; the white is vinous, dry, velvety, and full; the rose is delicate, fragrant, and dry. The red is ethereal, tending to brick-color with age; the white is delicate, soft, and dry; the rose is fruity when young. Six wines are produced under this label, including a Malvasia Nera that is velvety and lightly aromatic. Golden-hued dessert wine made from Moscato grapes that are dried on the vine and allowed to develop noble rot, thereby acquiring an intense aroma and high alcohol content. Delicate, best sipped in its first year; still or sparkling. Dry, quaffable, with a pronounced acidity and versatile character. Sweet wine made in a still, sparkling, and raisined version; fragrant and aromatic. Sweet, fragrant sparkling wine; lightly aromatic. Dry, straw-yellow, aromatic, and harmonious. An amber-hued, noble dessert wine from the Aeolian islands; also vinified in a raisined and fortified version. Straw-yellow wine that ranges from dry to sweet, with a light bitter aftertaste; sometimes fortified. The dry version of this wine has a characteristic toasted almond aftertaste; the fortified version is very refined and has an intense aroma. The red has a dry flavor and characteristic perfume; the rose has a pleasant aroma and slight bitter aftertaste. A fortified wine; various types of Marsala exist, classified according to age (the extra old is matured 10 years). A red Marsala has recently been introduced. Dry, delicate, fresh; vinified still or sparkling. Subtle hints of wood in some bottlings; still or sparkling, with a dry, herbaceous scent. The red is ruby to garnet with a pleasantly bitterish vein; the rose is lighter and crisper on the palate. The red has a savory, full-bodied flavor; the white has a grapey bouquet and delicate flavor. Delicate perfume; best savored within 1 year of production. Vinified in a dry and fortified version. The dry wine has an ethereal perfume and soft, velvety flavor; the fortified version presents a distinct aroma. Light ruby red wine with an intense perfume and dry or slightly sweet flavor; a sparkling version also exists. The red is harmonious, dry, and velvety; the white is lightly fruity and dry. Highly tannic, with a medium-dry, full-bodied flavor and blackberry aroma. Also vinified in a raisined version. Abruzzo's most important red; plummy, velvety, and dry, it ages well. Dry, austere, warm, and tannic with an airy, intense bouquet; ages beautifully. Sweet, amber-hued dessert wine; vinified still and sparkling. Semi-sweet and lightly sparkling dessert wine from the fertile Vulture zone. Sweet, aromatic, lively, only slightly fizzy. Exquisitely sweet, velvety dessert wine with a grapey scent; a fortified version is also vinified. Aromatic dessert wine vinified in a still, sparkling, and raisined version. Golden dessert wine which can be naturally sweet, sparkling, raisined, or fortified. A sparkling muscat wine with a straw-yellow color and spiced bouquet. Slightly dried grapes yield this golden wine with amber reflections; its characteristic aroma and delicate, velvety taste make it a superb dessert wine. Increasingly hard to find. Full, sweet-flavored dessert wine with an intense bouquet; also vinified in a fortified version. Golden dessert wine with a velvety, sweet taste; vinified in a naturally sweet and fortified version. Aromatic and intense dessert wine. Rose vinified in a still or sparkling version, with a perfume of roses. Harmonious, dry, and lively, with good acidity and fruitiness. Velvety with a slight bitter aftertaste. Delicate, with a subtle aroma of grapes; the fortified version tends towards gold in color. Red with less intensity and character than Barbaresco or Barolo; good for everyday drinking. Lively ruby-red color, dry flavor, lightly tannic, well-structured; plum and cherry on the nose, with a light to medium body. Still or sparkling, with a pleasant acidity; easy to drink and harmonious. Amber yellow color, intense nose, and dry flavor; the raisined version presents a notable chestnut aftertaste and is sweet. Lightly herbaceous overtones; better after 3 years of aging. Rich, potentially peppery, with an intense aroma. Dry, balanced, tannic red; slightly fruitier rose. A dry, medium-dry, or (rarer nowadays) sweet wine vinified since Etruscan times; the best is Orvieto Classico or Orvieto Classico Superiore, which offer rich honey, nut, and peach notes. The red is known as Ottavianello and offers a dry, harmonious flavor; the white has a delicate perfume and clean taste. This denomination includes a naturally sparkling red, a still medium-bodied red, and a dry white. The red wine is dry, balanced, full-bodied; the white is delicate and fresh; the rose is medium-bodied and crisp. Renowned dessert wine, sometimes made from raisined grapes; offers hints of peaches and apricots. Dry, medium-bodied, with moderate tannins; also vinified in a raisined version. Refreshing wine produced in a dry, semi-sweet, raisined, or sparkling version. Intensely hued, the wine ages marvelously in barriques. Distinctive bouquet, dry, full-bodied flavor, and intense color tending towards cherry. Vinified dry and sweet from the grape many believe to be the ancestor to Zinfandel; bold, heady, and intense. Sparkling wine vinified using the Charmat method, whereby a second fermentation occurs in the bottle; crisp, clean with persistent bubbles. Violet bouquet, notable acidity and tannins; it can be aged with great success. Sweet cousin of Amarone, vinified from raisined grapes; haunting aroma, full-bodied, moderately viscous. Powerful, fruity, semi-sweet or sweet, silky and well-balanced; made from raisined grapes. Characterized by a flavor of plums and a note of almonds, a medium to full body, and rather high acidity; the best is Refosco del Peduncolo Rosso from Aquileia. Deeply hued red, with a full, round, dry flavor and a tendency to bitterness. Dessert wine made from dried grapes; it offers a hint of cherries, berries, and wood. Known since at least 1289, it is light-bodied, floral, delicate, fresh, lively, and high in acidity. Delicate, crisp, mildly flowery, and vivacious. Fresh, dry, lightly aromatic, light-bodied, with pronounced acidity. Fragrant, fruity, velvety, persistent, and dry; meant to be sipped young. Noble wine with amber hues, fresh, herbaceous, almond scents, and dry flavor; also vinified in a sparkling version. Rare and extraordinary wine with a citron scent and a slightly bitter finish. Light ruby color, delicate bouquet, and strawberry nose; can be aged up to 10 years. Dry, full-bodied; ages up to 4 years. Dry, full-bodied, alcoholic taste, slightly bitter aftertaste. Full-bodied, harmonious, with an intense bouquet that softens as it ages; vinified in a novello version as well. Dry, moderately tannic, full-bodied, with color that tends to brick as it ages; slight bitter aftertaste. Brunello's younger brother, aged 1 year in casks; vivacious, fresh, with licorice and violet scents, warm and lightly tannic. A faster-maturing, lighter red than Vino Nobile di Montepulciano; dry, lightly tannic, with a violet nose. 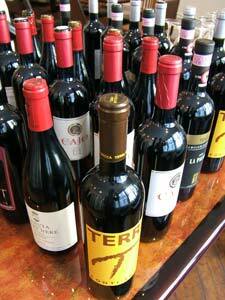 Ten varieties of red wine from the province of Terni; the Canaiolo and Ciliegiolo are especially characteristic. Lightly ethereal, subtly hued wine; has a fruity bouquet when young which becomes floral as it ages. Delicately aromatic, fruity, medium-bodied wine with a persistent bouquet. The red has an intense aroma and is best in its first 3 years; the white offers a delicate, fruity scent. The red and rose have a pronounced bouquet and full-bodied taste; the white is fresh, well-balanced. The red is velvety and dry; the white is straw-yellow, dry, and harmonious; the rose is refreshing. Light and tannic when young, smoother and more complex when aged 4 years. Numerous wines are produced in the area, including novello, raisined, and sparkling versions. Among the various wines produced in underground cellars of this medieval town, the white is most memorable. Round, dry, and harmonious wines. Ruby to garnet, with berry and almond aromas that become ethereal after brief aging. Numerous varietal wines are produced under this name in Agrigento. Four versions are vinified, including a sparkling version and a raisined version which tastes of ripe fruit and honey. Dry, full-bodied, robust yet haunting; among Calabria's best. The red is robust; the white has greenish hues and a pleasantly fruity taste; the rose is delicate, elegant, and dry. Light- to medium-bodied, velvety, with hints of violets and almonds. Known since at least 1282. Deep in color, medium-bodied, aromatically rich with hints of violets and pepper; velvety, warm, full, and elegant. The red is lightly tannic and full-bodied; the white is delicate, fine, dry; the rose is vivacious and harmonious. Rare dessert wine made from raisined grapes on terraced hillsides by a handful of producers. Dried grape wine from the mountainous Valtellina area. Characteristically fruity, fresh, and harmonious. Best-known of the region's wines; medium-bodied, delicately bitter. Produced in still and sparkling versions; the red is rustic, with notes of tobacco; the white varies from dry to off-dry; and the rose is medium-bodied. Ruby-hued and delicately perfumed red; the white is light-bodied, with good aroma. The red is robust and moderately tannic, best aged 3 to 4 years; the rose is delicately perfumed and velvety. Airy, intense aroma, full-bodied, well-balanced, with a long finish reminiscent of chocolate and licorice; aged a minimum of 3 years. Wine with a good balance of acidity and a delicate, fruity character. Lively, fruity, meant to be drunk within 3 years; a rose version has a light almond vein and bitterness. Intense ruby-red wine, dry, with a winy perfume, raspberry aroma, and pleasant acidity. The red is mellow, medium-bodied; the white is crisp and fresh; the rose is light. A sparkling version is also vinified. The red is mellower than the Torgiano Rosso Riserva; the white is crisp, with good acidity. Robust yet fine, packed with fruit, slightly oaky; ages well. Dry, velvety red with hints of wild rose and a tendency to develop an aroma of almond with age. Lightly aromatic, dry, and full-bodied, with golden hues. Delicate, dry, with a pronounced acidity. Light, crisp, simple, quaffable wine. Numerous wines are comprised in this denomination; cool mountain air makes these wines refreshingly crisp. Pleasant bouquet, velvety, bitterish, well-balanced; sometimes reminiscent of bitter almonds. Con ripasso indicates the use of unpressed skins of grapes from which Amarone or other dried grape wines are vinified for greater intensity and character. Dry, austere, slightly tannic, with a persistent fragrance; aged a minimum of 2 years. Herbaceous scent, elegant flavor, and good structure make it a good mate for hearty fare. The red is sometimes aromatic, velvety on the palate; the white has a soft, dry flavor; the rose is mellow. Refreshing, crisp, with light greenish hues and a grassy nose. White vinified in a still, sparkling, and raisined version. Dry, slightly tannic, with a honey aroma; vinified in a dry and in a semi-sweet raisined version. The best is vinified in the Ramandolo area. Versatile wine with a deep straw color and grassy notes. Subtle, delicate aroma and dry taste; straw-yellow color, light bitter undertones. White with greenish highlights and a dry, fresh, acidic taste; the sparkling version presents an intense foam and fine, persistent perlage. Sherry-like wine with a warm, dry flavor and almond blossom notes; the fortified version can be sweet or dry. Fine, penetrating aroma, mineral backbone, slightly bitter finish; smooth, nutty, hinting of fruit and honey. Sparkling wine obtained from slightly raisined grapes; medium-dry or sweet, it has a refined and persistent perlage and aroma of ripe fruit, jam, flowers, and spices. The red is ruby-hued, dry, suited to a wide range of dishes; the white is crisp and dry; the rose is less intense than the red. Raisined dessert wine with an amber hue and dry, semi-sweet, or sweet flavor. Intense, dry, slightly tannic, full-bodied, robust, with hints of violets; ages well. Soft and harmonious, dry or off-dry, with a straw-yellow color.